In our office, we utilize ultrasound technology on a daily basis for the visualization of the thyroid gland, detection of thyroid cancer, and to diagnose parathyroid adenomas. The accuracy of the current 2D measurement is limited – particularly for lesions with irregular margins or shape. Irregular shape is an independent risk factor for thyroid malignancy. Better visualization of margins may improve the staging of malignant nodules prior to surgery. The 3D volume technology with 3DTHYROID® may become an important tool in diagnosing malignant thyroid lesion. We have utilized 3D technology, referred to as 3DTHYROID®, in our office to detect malignant thyroid nodules and to help with needle guidance for Fine Needle Aspiration Biopsy (FNAB). This reduces the rate of false negative pathology reports for FNAB since the physician can visualize the needle from several different angles. 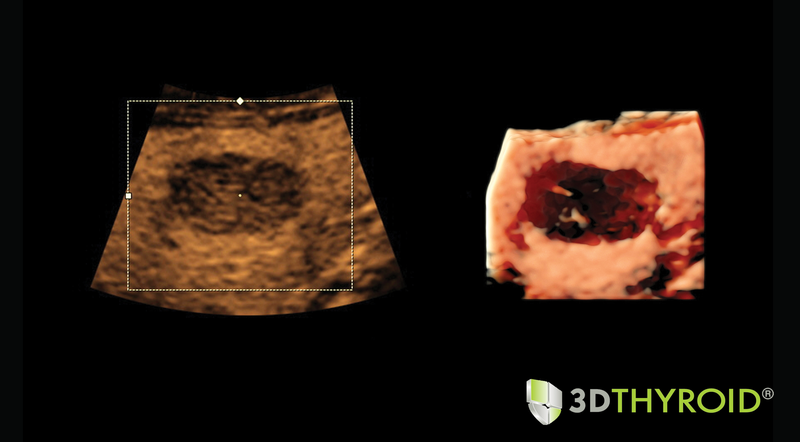 This is probably the most important advantage of 3D ultrasound technology when compared to 2D ultrasounds.